History will show another Canada Sevens where the hosts failed to make the quarter-finals, mush less threaten the podium. But the victory over the Olympic champions from Fiji showed, albeit fleetingly, what can be achieved for the Canadian men. It is always, "They," never, "We." It is the first and most important rule of sports broadcasting. I am not paid to be a homer or a cheerleader; I'm paid to be impartial and objective. Without exception, balance is essential. From time to time that is easier said than done. Like you, I am a fan at heart; a supporter of the game and of Team Canada. Show me someone who doesn't love an underdog and I'll show you someone who doesn't grasp the emotional attachment necessary to maximize the experience. It is a simple concept. The lesser team, often with the benefit of noisy, passionate fans, ups its game. The players respond to the vocal encouragement, not wanting to let down the paying spectators. A unique bond is born and the result is a powerful combination. That is what happened when Canada played Fiji in Vancouver. There is no other logical explanation. No doubt the Canadians felt they owed the fans a performance following a meek loss in their pool opener against Samoa. The hosts going head to head with the defending champions. The Canadians massive underdogs against a team of physically huge and technically brilliant athletes. Even the most optimistic and ardent Canadian supporter must have feared the worst. I checked my game notes one more time. The portents were ominous. Canada had beaten Fiji only four times in 51 all-time meetings. This could get ugly and predictably lopsided in a hurry. The narrative was surely set – a routine Fijian win would naturally ensue. What followed will live long in the memory. Canada defied the odds to build an early lead, only for Fiji to level matters at halftime. The hosts got ahead again after the interval only to be pegged back a second time. In a rousing finale, Canada kept its nerve and executed one final time to beat the Olympic champions. It was one game. 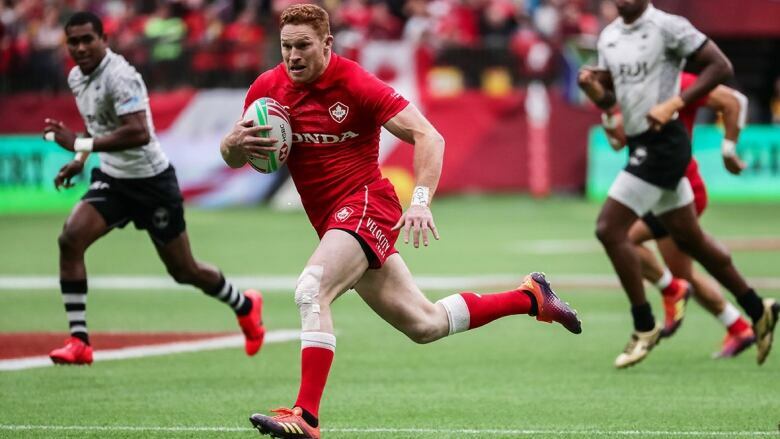 Its outcome was immaterial to the eventual standings at the Canada Sevens. But it was a moment that illustrated both the best and the worst of Canadian rugby. Let's assume the glass is half full. Canada has the technical ability and collective commitment to beat the best. This was no fluke result. Canada, elevated by its boisterous fans, found another gear and the belief to post a famous win. Ironically it also served to highlight Canada's main weakness. In a word: inconsistency. It is endlessly frustrating. Canada CAN do it, just not on a regular enough basis. It is an Achilles heel that refuses to heal. I am certain Canada does not want to be regarded as a "once in a while" team. It has the talent but all too frequently the composure is lacking. It is, by definition, a vicious cycle. Without the confidence that only comes from the ability to execute, mistakes are bound to repeat themselves. The Canadians can learn from their neighbours. Team USA has been model of consistency this season and demonstrated the capacity to recover efficiently after setbacks. It is this mental toughness that is so often the difference between elite athletes, regardless of the sport. History will show another Canada Sevens where the hosts failed to make the quarter-finals, mush less threaten the podium. There are no medals for finishing 10th but Canada showed, albeit fleetingly, what can be achieved. As for the fans, they didn't put a foot wrong. There are great rugby venues across the globe and Vancouver is becoming one of them. It is an annual festival with fancy dress in all its splendor providing the most colourful and entertaining backdrop to complement the action on the pitch. They clearly enjoyed the weekend entertainment, and it is gratifying to hear Vancouver will continue to host this feast of rugby for at least the next four years. Ultimately Canada finished where they should – well down the pecking order. But for 14 magical minutes against Fiji the fans were on their feet. Me too.